You know that feeling you get when you turn on a fighter for the first time and see this fantastic intro sequence video that completely gets you in the mood for battle? The Soul Calibur series comes to mind when I think of fighters with amazing intros and now the Street Fighter series comes to mind thanks to the beautifully created intro video complete with its own theme song in Street Fighter IV. There are few fighters that display quality simply by looking at the main menu design and overall appearance but Street Fighter IV gives you the impression of a high quality fighter from the get go much in the same way that Soul Calibur IV and Virtua Fighter 5 did the first time I played them. Each menu option has a high quality pic from the intro as you cycle through the various menus and the theme song from the intro constantly repeats in the background. 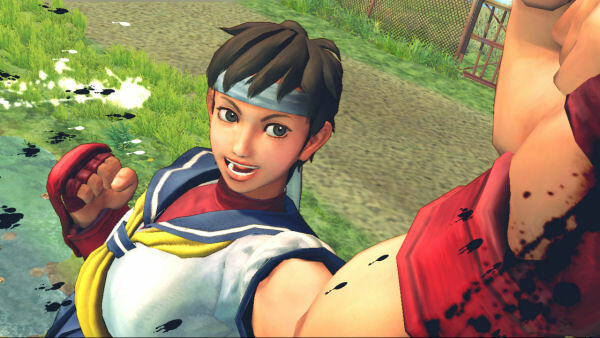 The main modes of Street Fighter IV are Arcade, Versus, Network battle, and Challenge mode. Arcade mode allows you to fight your way through several opponents while on your way to that character's rival and the final boss of the game. It has several modes of challenge ranging from extremely easy to extremely hard. Arcade mode begins and ends with an anime video showcasing that character's story. As you might expect, the voices are dubbed by default but there is an option for the original Japanese voices. The dubbed voices don't match the lip movement that well and some character voices fit the characters more than others when it comes to the English track. The overall story of the game is pretty basic which is usually the norm for a fighter, but I felt that I have to make a mention that many of the endings felt very unsatisfying and short. The really neat part about Arcade mode, when compared to other fighters, is that you have an option for a fight request through online battle, which can be turned on and off and set to player or ranked matches. This option, which can be changed on the main menu, basically sets up a lobby online where a player can choose to play against you via a fight request while you're playing arcade mode. Just like back in the old arcade days a gamer can once again experience the feeling of a new challenger breaking into their arcade run. It's really neat how one can simply play CPU opponents while waiting for a new challenger instead of having to watch a fight on the screen while waiting. You'll most likely want to start the game with this feature turned off so you can beat the game, but it’s a nice addition for when you want to fight some online gamers in later arcade playthroughs. Versus mode is pretty much your standard versus through local play. Network battle allows you to set up your own lobby and find gamers that have their fight request active while playing arcade mode. Many of the games that I played online ran smoothly with very minimal lag at times, but you'll still run into matches where lag is very evident. Each opponent's current network status is displayed by their usernames so you can easily pick out a lobby where you won't experience lag. Challenge mode has three basic sub modes included within. You have a time attack, survival, and trial mode. Time attack allows you to fight through a series of opponents for the best time and grade you at the end based on how well you did. Survival pits you against several opponents and only heals you a certain amount in between battles. Trial battle mode is a training mode that sets up certain moves or combination attacks to perform in order to advance through it. It starts out like a usual training mode but it's also a good learning experience, but I felt it could have showcased more of a variety of combos rather than just a few and it really should allow you to skip some of the combinations and move onto others. Just because I can't chain a Strong Kick into a super keeps me from moving onto Crimson Viper's other move sets in that sequence of combination attacks, which was unfortunate. Overall, Challenge mode feels repetitive and boring for the most part except for some slight learning in Trial mode. Some other exploration mode should have really been used instead of the all too familiar modes of play we have here.